Design projects of Peter Dong, neuroscience Ph.D. candidate at the University of Pennsylvania. No matter the application, I aim to create works that are clean, visually appealing, and rationally designed. The Mahoney Institute for Neurosciences fosters and supports cross-disciplinary and cross-campus research in neuroscience at Penn. The Institute organizes an annual weekly seminar series that features neuroscientists from around the country invited by both faculty and students to present their research. 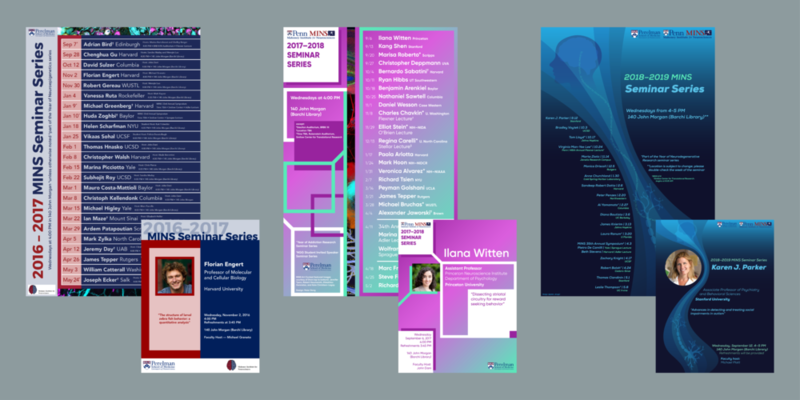 I created designs for posters that outline the entire slate of talks planned for the academic year (a first for the seminar series), and applied the design motif to flyers for each week's talk. On the left is a flyer I made for the Neuroscience Graduate Group at Penn. A thesis defense represents the culmination of the research conducted during graduate school and is the last major hurdle a Ph.D. candidate faces before receiving her or his degree. The first half of a defense is a scientific talk that is open to the public, and I applied neuron imagery created by a previous NGG student to a flyer that announces these milestone events. In the center is a poster that displays the slate of talks featured in the Year of Neuroepigenetics seminar series hosted by MINS. I created imagery that links together the themes of neuroscience (represented by a neuron) and genetics (represented by a strand of DNA) to form neuroepigenetics, a study of how the modification of genes without altering their sequences can lead to changes in the context of neuroscience (represented by histones, an example of one such epigenetic modification). On the right is a poster for a MINS student retreat on neurodegeneration, a process represented by brains and symbols of life events that gradually fade from top to bottom. 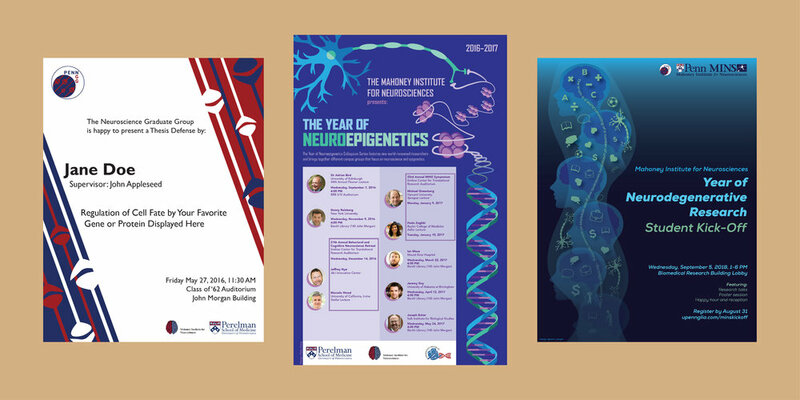 The Neuroscience Graduate Group at Penn organizes biannual talks given by prominent neuroscientists at Penn geared towards the general public. For the fall 2016 talk, I created designs that tie together the themes of neuroscience and food by integrating the shape of the human brain with various references to food. For the spring 2017 talk, I created a flyer with designs that evoked images of the nighttime and sleeping. For the fall 2017 talk, I designed an image of a brain "hijacked" by various addictive substances. For the spring 2018 talk, I depicted a spinner wheel with imagery linked to decisions, as well as a brain and a neuron to form the spinner itself. For the fall 2018 talk, I created a flyer with 9 brains in an array of color schemes to represent the varying landscapes of mental illness. Neuroscience and design truly intersect when I receive opportunities to create illustrations that help communicate scientific knowledge and concepts. On the left is one in a series of images I created for a review paper on the development of touch-sensitive neurons. On the right are samplings of works I created for a variety of applications, including research articles, reviews, grant applications, and presentations. GLIA (an acronym inspired by the name of support cells in the nervous system) is the student organization of the Neuroscience Graduate Group at Penn. I created a design that incorporates yet distinguishes between the two entities though color, and features the "A" of "GLIA" shaped into a neuron—thus giving representation in the logo to the two major classes of cells in the nervous system. Created for the Penn Center for Innovation (PCI), this logo was intended for use by a startup developing products that promote post-surgical wound healing. A slightly modified version of the top design was selected for use. An alternate logo, shown at bottom, is an abstract and distinct design that evokes the letter "P" and features a streak that represents advancement and the closure of a wound. Created for the Penn Center for Innovation (PCI), this logo was intended for use by a startup developing products that augment traditional microscopy techniques. The top logo was selected for use, which features a blurred sphere coming into focus—a design paralleled by the company name. An alternate logo, shown at bottom, features concentric spheres that represent microscope objectives and magnification. Emanotech is an independent management consulting firm that specializes in the pharmaceutical industry. Asked to create a logo with characteristics that evoke an emanating sun, I designed a wordmark that includes a letter "O" with concentric crescents in two shades of orange. The "O" can also be utilized by itself for application in smaller spaces, such as on a business card or as a favicon. Created for the American Journal of Kidney Diseases, this design was used for the 2018 edition of NephMadness, a competition during the month of March in which medical professionals compete in teams to highlight various topics in nephrology. I molded brackets evocative of basketball's March Madness into a kidney shape and used AJKD's colors to design a logo appropriate for the event. Created for the Penn Center for Innovation (PCI), this logo was intended for use by a startup developing products to restore skin pigmentation. Asked to design a logo based on the shape of the flower of Linnaea borealis, I used a gradient to represent the recovery of skin color. The logomark was eventually incorporated into a version of the logo that featured a typeface different from the one shown here. The Penn-PORT program, funded by the National Institutes of Health, is an IRACDA postdoctoral fellowship that combines traditional lab research with teaching opportunities at Philly area minority-serving colleges. I created a logo that highlights these two components of the fellowship by merging the image of an apple and a flask in Penn colors (representing teaching and research, respectively) into a single entity. Created for the Penn Center for Innovation (PCI), this logo was intended for use by a startup developing hand sanitizing solutions. The bottom logo was selected for use, which features a flower shaped design that evokes a sense of natural cleanliness. Alternate logos, shown at top, isolate the "inno" prefix—associated with innovation—from the "fect" suffix—associated with infection. Sharp Sports Analytics is a blog that aims to use cutting-edge statistical techniques to give insights into the world of sports. I was asked to create a logo for SSA, which evolved into a complete visual identity. To give a story to my ideas, I was inspired by Paul Rand's classic logo presentations and compiled a document that outlines the development of the visual identity from the reasoning behind its origin to its use in various applications. The full document can be viewed here.